The processes for Vacation Watches or Special Watches have recently changed. Phase I currently only participates in the “Vacation Watch” program in cooperation with the Hillsborough County Sheriff’s Office. Phases II & III are still utilizing the “Special Request” watch via U.S. Security Associates. Please follow the protocol below carefully for your individual phase in order for your request to be valid. You will not be notified of an incorrect submission. The Phase I Board of Directors unanimously decided to reallocate funds from the Community Patrol to our efforts to reduce speeding and to implement our Village revitalization efforts. U.S. Security Associates no longer provides Special Watches in Phase I of our community. Phases II & III have currently enlisted the assistance of U.S. Security Associates to provide Special Watch services while Phase II and Phase III residents are away from home. 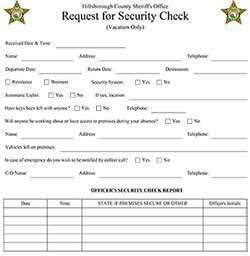 Please complete the form below, in its entirety, and your information will be sent to the patrol officers. When completing the form, please remember to give as much information as possible about your travel dates and times. If Yes, Does Emergency Party Have Code to Deactivate/Rearm Alarm? Are Visitors Expected While You Are Away? Will There be Car(s) in the Driveway?